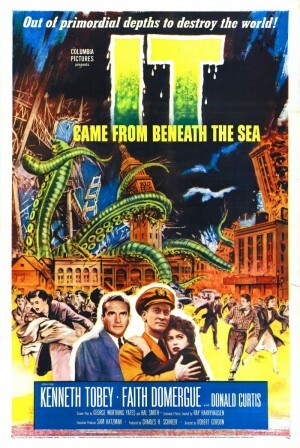 “It Came From Beneath The Sea” is a movie which you have to watch from a perspective in the day and age it was made. Some of the monster movies from that time still hold up, but this one, not so much. Even for that time this movie had a very low budget, which is responsible for the handful of special effect shots we get. The shots which are their were made by non other than Ray Harryhausen, so the shots of the stop-motion octopus are still quite good. But even for his doing nothing really stands out or is revolutionary. Prof. John Carter: Here, gentlemen, is your villain. (pointing at a fish tank with a small octopus inside it). Naval Asst. Sec. Robert David Chase: It would take an enormous number of those to disable a Navy submarine. Prof. John Carter: Look, Pete, you don’t see many women in the Seagoing Navy. Cmdr. Pete Mathews: Are you kidding me? Prof. John Carter: Oh, shoreside women, sure. But there’s a whole new breed who feel they’re just as smart and just as courageous as men. And they are. They don’t like to be overprotected. They don’t like to have their initiative taken away from them. No, “It Came From Beneath The Sea” in the end isn’t the cult classic it’s supposed to be. Harryhausens prop work can save it a little bit, but there is just to little to make it worthwhile. So, only watch it if you really enjoy the genre.